Product in this post was provided to me, the project and opinions are all my own. I love perusing home tours and magazines with beautiful spreads featuring coastal homes. These homes are so bright and inviting. Touches of blue and red on crisp yet cozy white backdrops. I am landlocked here in the Midwest and do not have anything close to coastal decor, however I do have a few nautical touches. I particularly like to bring out these pieces in the summer. 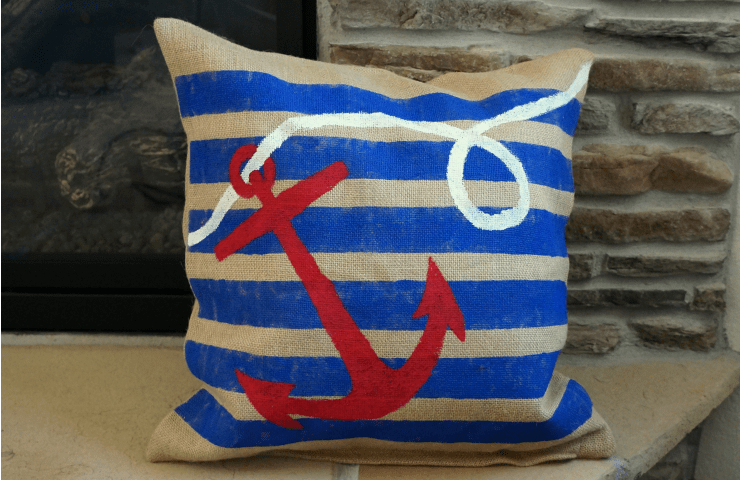 This week I created a nautical painted burlap pillow to add a fun coastal vibe to my living room for the summer. I’m teaming up with some friends who have all created fabulous pillows and are sharing them today. Be sure to scroll all the way through and check out this month’s Dose of DIY Blog Hop. To create this pillow I started with an 18 inch burlap pillow case from BurlapFabric.com. I’m a fan of burlap year round, I use it on my Christmas tree, my spring mantle, and everything in between. This pillow case was a blank slate to create something fabulous. I wanted a pillow with an anchor, and a nautical look. I opted for blue stripes, a red anchor and white rope. A few notes on painting this pillow. Paint on burlap will bleed. I used a sponge brush with very little paint for the stripes and painters tape as a guide. The tape doesn’t stick well to burlap, but will act as a guide to help with straight lines. The anchor is an image I printed on a piece of letter size paper then cut out. I traced it onto my pillow using a red pen then filled it in with red paint using a small brush. For the rope, I used a piece of white chalk to draw my outline, the chalk wipes away easily, then filled it in with white paint. I’ve painted on burlap before using different techniques. For this burlap wall art I used a freezer paper stencil that gave me very crisp clean paint lines. I absolutely love how this pillow turned out. A burlap pillow case is something you can put your own spin on and do just about anything with. BurlapFabric.com has some great inspiration on their Facebook page for how you can use this pillow cover and their other products. If you are looking for a burlap blank of any kind, this is the place to go. Want some DIY pillow inspiration? 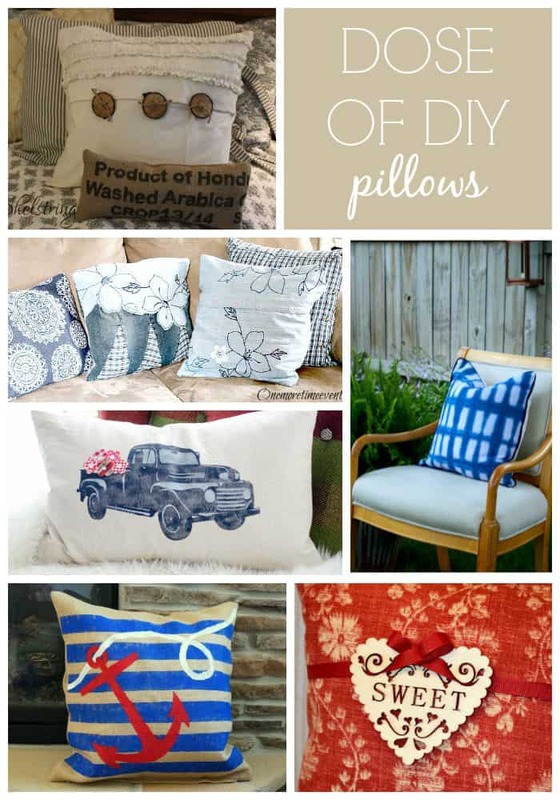 Take a look at these beautiful pillows my creative blogger friends made. Be sure to click through and check out their full tutorial. What a lovely pillow and great tips for painting on burlap! Thanks! 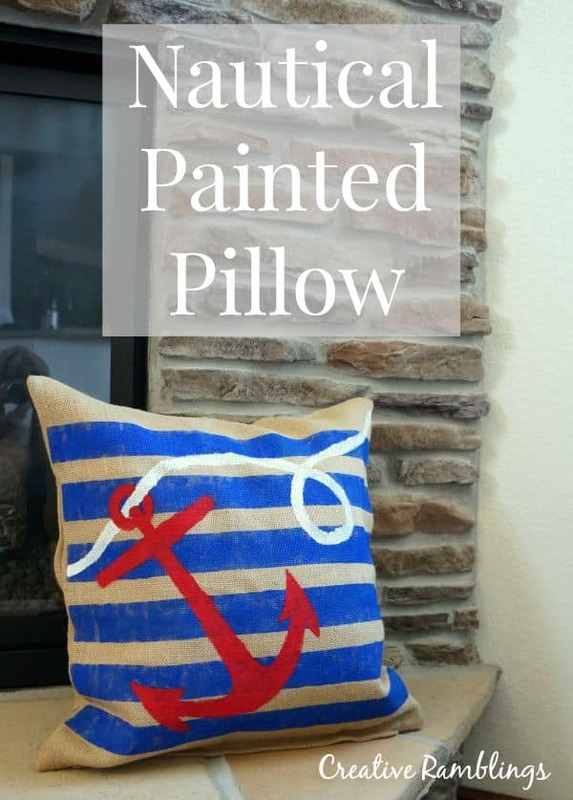 Your pillow came out so cute…love it and the great tips on painting on burlap! Love your nautical pillow Sarah and I also appreciate the tips on painting on burlap. Thanks! Thank you so much Michele. Painting burlap was intimidating at first, but I’m so glad I tried it.